Some of you may have heard this already, but apparently Dan Haren (who is having a great start to his season thus far) is a lucky mofo when it comes to gambling. Apparently he entered into two different Kentucky Derby pools and was randomly assigned the same horse for both pools. His horse, as you could guess, was Mine That Bird. That has got to be the greatest sway from worst to best break ever. Oh, and he also won his March Madness tournament. And he recently took home Alessandra Ambrosio when she was in Arizona watching a game. OK, so I made up that last one. But if that did happen, would you be shocked? 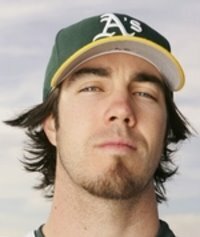 You are currently browsing the archives for the Dan Haren category.